Two little matched sets today, four by Sir Walter Scott and four by Robert Louis Stevenson. Great books from Scottish authors! Thank you for sharing these. The only one of these I've ever read is "Kidnapped," so I'd love to have them! I love these books, fabulous! These would be a great addition to my collection. I would love to have the books! Great weather for afternoon reading, thanks for the Friday Giveaway. Raising hand to join in the giveaway! Thank you! 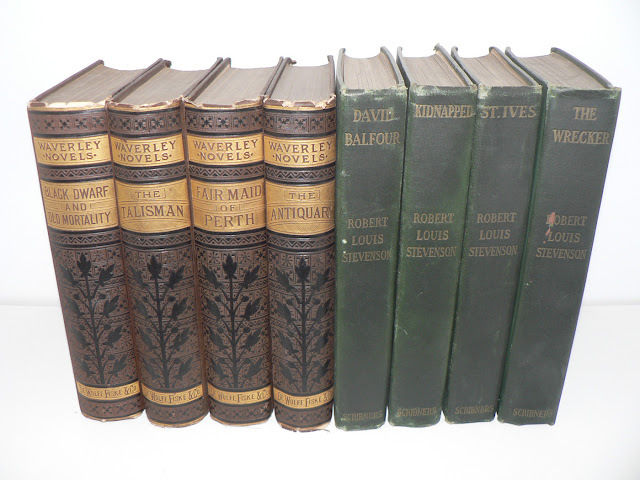 I would officially love those books, especially the Stevenson set... thanks for offering them! Great selection, count me in! Be some nice shade tree reading there for this summer. Very nice. Thanks for the giveaway. The Stevenson Set really looks awesome.. would love to have these! Two great authors. You may give them to me. I would gladly accept one book of the two collections. Beautiful jackets. Count me in.